Tennis elbow (or lateral epicondylitis) is characterized by the inflammation of tendons connecting the forearm muscles to the exterior elbow, causing pain and discomfort. The condition results from joint overuse, especially in cases of repetitive motion. While tennis and other racquet sport players are significantly more susceptible to this ailment, any exhaustive action may be accountable for its eventual development. Composed of three bones – the humerus, radius, and ulna – the elbow joint is held in place by a system of muscles, ligaments, and tendons. The epicondyles form the bony bumps of the elbow, while the Extensor Carpi Radialis Brevis (ECRB) tendon acts as a primary source of elbow movement and stabilization. If the ECRB becomes weakened through overuse or experiences microscopic tearing, the inflammation and pain associated with tennis elbow may result. In addition to athletes, individuals participating in vigorous work or recreational activities may run the risk of developing tennis elbow. Professions exhibiting a higher than average rate of the ailment include: painters, plumbers, cooks, and autoworkers. This frequency is likely associated with the emphasis on weight-based repetition that characterizes these roles. Furthermore, individuals aged 30 to 50 years also show an increased prevalence for the development of tennis elbow. The symptoms of tennis elbow are progressive in nature and often intensify over time. As the condition is not typically associated with a specific injury or traumatic event, pain will often begin as a mild discomfort or burning sensation. Eventual weakness will become a concern, making forearm activities difficult and increasingly painful. In the diagnosis of tennis elbow, your experienced hand surgeon completes an in-depth analysis, including the completion of a medical history, as well as a series of strength, mobility, and resistance tests. 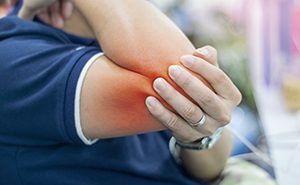 If you have experienced a previous elbow injury, rheumatoid arthritis, or nerve disease, you should notify your physician at the time of assessment, as any of these factors may imitate the condition. If the initial examination suggests tennis elbow, additional tests, such as an x-ray, MRI (magnetic resonance imaging), or EMG (electromyography), may be recommended. These procedures will allow your doctor to assess the level of damage severity and determine the best approach for comprehensive treatment. For the majority of patients suffering from tennis elbow, non-surgical intervention will prove advantageous. Recommended approaches may include: resting your arm, utilizing anti-inflammatory medications, steroid injections, bracing, and/or physical therapy. In most cases, any repetitive action or activity will be discouraged and avoided, if possible. If surgical treatment is prescribed, your doctor will recommend the most suitable intervention approach, as based on your specific injury and activity needs. Whenever possible, arthroscopic surgery techniques will be utilized, decreasing your risks for associated scarring or infection. Following your operation, you will likely be prescribed to wear a splint for at least one week, or until all associated sutures and dressings are removed. Once your splint is no longer needed, you should follow the regimen of at-home exercises and/or formal physical therapy outlined by your doctor. While you should be able to return to most physical activities within 6 months of operation, full recovery will depend on your post-operative adherence to treatment and care recommendations. An expert in the treatment of tennis elbow, Dr. Lemmon is a board certified plastic surgeon at the Regional Plastic Surgery Center. If you would like to schedule an appointment, contact our office.